You’ve all wondered what the inside of Captain Mack’s Head Shop looked like, well now you can find out. It’s under new management and the Platinum Surfer is the new owner. She is a fun loving, free spirit who loves the fresh air and thrill of adventure. Summer is her time to shine, and she wants to share her love of summer with you. While you can also get all your head morph needs from the Platinum Surfer, she is also hosting the Limited Time Summer Shop. 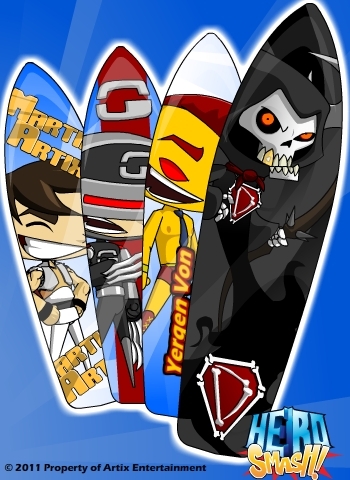 There are over 25 items for beating your enemies while staying cool under the sun, including character surf boards, armors, weapons, and sunglasses. What’s all this Hocus Pocus? The Market Street Movie Plex is featuring the new movie Hocus Pocus Hijinx, and the star, Harriet Popper, has arrived on Market Street representing Swinescabs (the traveling Wizard Academy). Before Sam and Dean could even get their Hocus Pocus Hijinx movie merchandise, Harriet Popper has appeared looking for help. 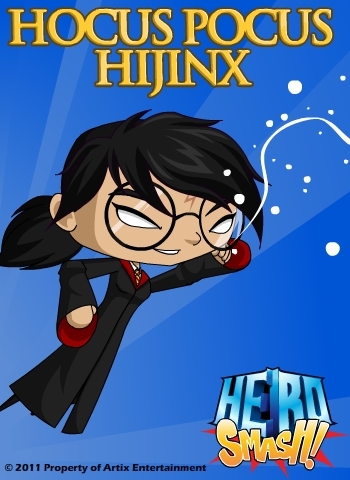 Speak to Harriet to learn how to craft the 6 new magic powers, including the most powerful spell yet in HeroSmash: "Abra Cadavra!" New magic powers are also available in Professor Smash’s Power Academy. We are magic CRAZY! HeroSmash now has a power up button. Similar to the “rest” button this button (located next to the Fly button) will boost your regeneration power while not in combat. Hit Power Up and start that health bar rising. Yet again, Randor, Zheenx, and Jemini have made some out of control items. Dumoose has done wonders with the new powers as well. Yay for us! There is a certain robot movie in theaters now, and the Market City Mega Plex is getting it's own robot movie this Thursday. 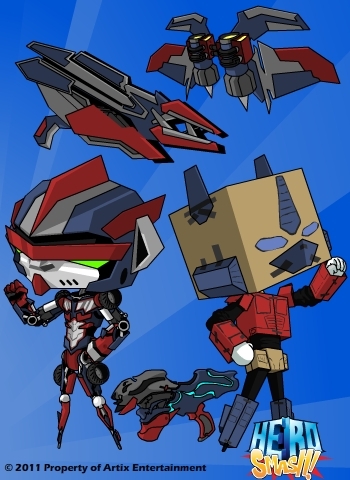 I present to you... Robo Morphers!! The current Lime Flashlight items will be going away for good this Thursday when the Robo Morphers take over. 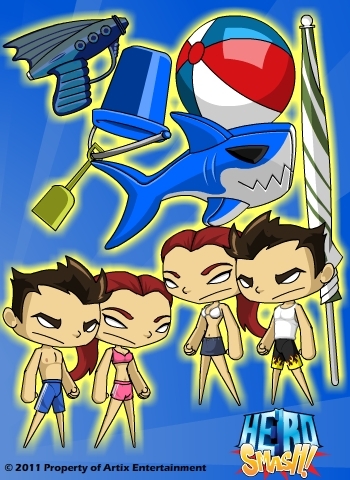 "AdventureQuest", "DragonFable", "MechQuest", "ArchKnight", "BattleOn.com", "AdventureQuest Worlds", "Artix Entertainment", "Artix" and all game characters are either trademarks or registered trademarks of Artix Entertainment, LLC.